The Mission of The Bach Choir of Bethlehem and its Bach Festival Orchestra is to perform the works of Johann Sebastian Bach and to promote and encourage appreciation of the aesthetic and spiritual value of Bach’s music, while striving for the highest standards of musical excellence. We achieve this mission by engaging our audience – locally, nationally, and internationally – through education and performance, including works by composers who influenced Bach and were influenced by him, and through the programs of our Bel Canto Youth Chorus. Together, we cultivate a lifelong passion for the choral arts. The Bach Choir of Bethlehem is the oldest American Bach Choir, and gave the first American performances of Bach’s Mass in B Minor and the Christmas Oratorio. Since its founding in 1898, the Choir has been attracting thousands of national and international visitors every May to its annual Bethlehem Bach Festival. Under the direction of conductor Greg Funfgeld since 1983, The Choir’s activities have expanded to a year-round season of 35 concerts and educational programs for an audience of more than 20,000; recordings for the Dorian and Analekta labels, films for PBS and Classical Kids, and touring performances including the Thomaskirche in Leipzig, Germany; the BBC Proms, Royal Albert Hall, London; Carnegie Hall and Trinity Church Wall St, New York City; and the Kennedy Center and Music Center at Strathmore in the Washington D.C. area. The Bach Choir of Bethlehem is an all-volunteer choral ensemble. Auditions for next season (2019-2020) will take place in August, 2019. Each singer is asked to sing an aria or hymn of their choosing, as well as to do some sight-reading and vocalization. All auditions take place at the Bach Choir Office, the historic Heckewelder House. Please call the Bach office 610-866-4382 Ext. 110 with any questions about the Choir or auditions. "The knowledge that our organization’s financial affairs are being managed in a conservative and prudent manner is a comfort to anyone who makes a gift to The Bach Choir of Bethlehem." "The Bach Choir is truly a wonderful organization committed to preserving the rich history of baroque music for multiple generations to experience and enjoy. B. Braun is proud to sponsor this year’s Gala, which features the German boys choir. The Bach Choir is not only a regional asset in our community but a national treasure as well." “They haven’t missed a Bach Festival for the past 25 years. When asked to comment on their favorite aspects of the Festival, Ginny is quick to reflect on the uplifting spiritual renewal she experiences at each concert, while Randall speaks with great reverence about the Mass in B Minor, which he says has the same powerful effect and 'feels fresh' each time he experiences it." “We firmly believe that by supporting the Bach Choir of Bethlehem we are providing opportunities for others to experience the wonder and joy of our locally based national treasure." —Madelyn Dundon, Bethlehem Catholic H.S. "It is so wonderful to be in the presence of so many music lovers at Festival time. And then to hear the glory of the Mass. Words cannot describe the joy that I feel when I hear it." Greg Funfgeld is now in his 36th season as artistic director and conductor of The Bach Choir of Bethlehem. He has expanded the programs of The Bach Choir beyond the annual Bach Festival to become a year-round season of 31 concerts and educational programs with an audience of more than 20,000. Mr. Funfgeld led The Choir on two major concert tours, to Germany in 1995 including the Herkulessaal at Munich’s Royal Residence and the Thomaskirche, Bach’s church in Leipzig, and to the United Kingdom in 2003 including a performance for the BBC Proms in London’s Royal Albert Hall. 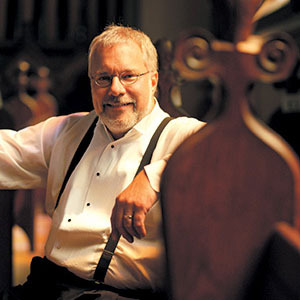 He also directed The Choir’s Centennial performances at the Kennedy Center and Carnegie Hall (1999-2000), performances at Saint Paul’s Chapel and Trinity Church, Wall Street as part of a series of concerts entitled Remember to Love, presented in observance of the 10th Anniversary of 9/11, and most recently Mendelssohn’s Elijah at the Music Center at Strathmore (2013). Commissioned works during Mr. Funfgeld’s tenure have included Libby Larsen’s Cantata I It Am – The Shewings of Julian of Norwich, co-commissioned with the BBC Proms; and Stephen Paulus’ A Dream of Time, commissioned in honor of Funfgeld’s 25th anniversary with The Bach Choir and included in the Songs of Hope recording for Analekta in 2011. Under Mr. Funfgeld’s leadership, The Choir has released 12 recordings, most recently A Child's Christmas in Bethlehem on the Analekta label (2013), and co-produced two films—the PBS documentary, Make a Joyful Noise, and the internationally distributed Classical Kids’ DVD, Mr. Bach Comes to Call. Mr. Funfgeld is the architect and director of the Choir’s outstanding educational outreach programs, including Bach to School, Bach at Noon and the annual collaborative Family Concert. These programs were awarded National Endowment for the Arts Grants in 2011-2017, and an international award from the J.S. Bach Foundation, Switzerland in 2012. Mr. Funfgeld is a member of the advisory board of The American Bach Society. Mr. Funfgeld served as the director of music at First Presbyterian Church of Bethlehem 1976-2016. Bridget George came to The Bach Choir as Executive Director in 1997. She has led the administration of The Choir through the implementation of five Strategic plans and 20 concert seasons that have included the Centennial Celebration (1998-2000) and performances at Kennedy Center, Carnegie Hall, Severance Hall, Saint Paul’s Chapel, Trinity Church Wall Street, and the Music Center at Strathmore. Ms. George was responsible for booking and administering The Choir’s eight-concert United Kingdom tour in 2003, including a performance for the BBC Proms. Ms. George was executive producer of the film Mr. Bach Comes to Call, produced by The Bach Choir with Classical Kids/The Children’s Group, and broadcast nationwide on PBS in 2007. She has been involved in the production of ten of The Choir’s recordings including, most recently, A Child’s Christmas in Bethlehem (2013) for which she compiled the spoken word. She also helped produce the Lehigh Valley PBS production of Make a Joyful Noise—an Emmy-award winning documentary on The Choir, and was the compiler and editor of Dear Mr. Funfgeld, published by The Choir in 2013. Born in England and educated at Oxford University, with a BA in Philosophy and Psychology, Ms. George sang with Oxford’s ScholaCantorum under Andrew Parrot. She also has a Diploma of Education from Goldsmiths College, London and was a teacher at Coburg Primary School, London, specializing in music and drama education. Since moving to Bethlehem in 1976, Ms. George has worked full-time in the field of arts administration. 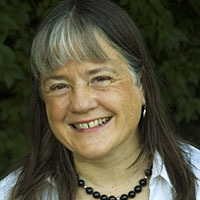 She co-founded Touchstone Theatre in 1981 and was the company’s Producing Director from 1990-95. Her accomplishments at Touchstone included producing the international Theatre of Creation festival, and co-producing a play with Chile’s Teatro la Memoria. Ms. George has served on panels for the National Endowment for the Arts and the Pennsylvania Council on the Arts. 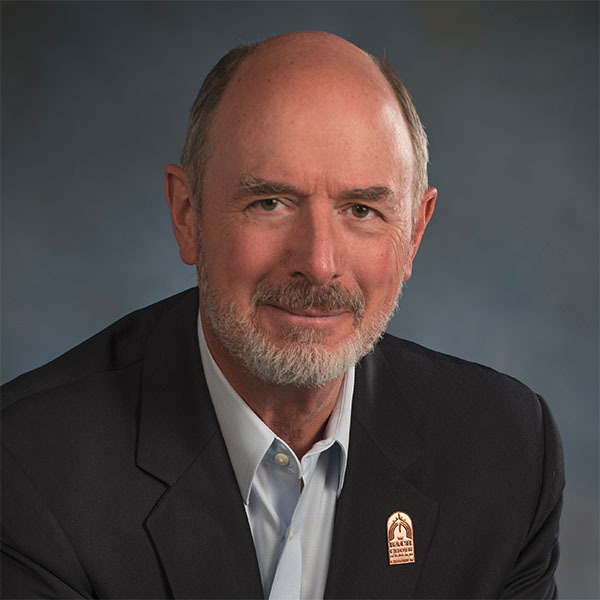 Hal Black has been President of The Bach Choir since 2014 and a member of the Board of Managers since 2003. During his tenure, on the Board he has served as chair of the Guarantor Committee. Marketing Committee, the re-Imagining the Bach Festival Task Force, and co-chair of the 2013 Gala, as well as assistant treasurer on the Finance Committee. Hal has one of the highest records of board members for attending The Choir’s concerts and social events and bringing friends to experience The Choir for the first time. He also likes to listen in on The Choir’s Monday night rehearsals and he and his wife Allison have been generous supporters of The Choir in countless ways. Mr. Black was an executive at Air Products and Chemicals, Inc., where he held various positions in commercial development, strategic planning, and mergers and acquisition during his 30-year career. Prior to that he worked in research and development and engineering for DuPont de Nemours and Co. and the Uniroyal Chemical Company. He retired in 2011. He holds degrees in Chemical Engineering, Spanish, and Business from Bucknell University and the University of Delaware. In retirement, Mr. Black has been active in the field of mergers and alliances among non-profit organizations, has lent his skills managing programs for the Community Action Committee of the Lehigh Valley and serving on the Board of Habitat for Humanity, and has helped Trout Unlimited form a fly-fishing club at Lehigh University. He has also begun the study of piano and music composition and has had original compositions performed in recital at the Community Music School. He and his wife Allison, who is an avid equestrian, enjoy travel and attending live performances of music in all genres. Owner of Cardstock Warehouse Paper Co., Inc.
Members of the all-volunteer choir come from all walks of life and collectively donate over 10,000 hours annually for rehearsals and performances. To learn more about how to become a choir member, please see Auditions below. The roots of The Bach Choir of Bethlehem, the oldest Bach Choir in America, go back to Colonial times and to the Moravians who settled Bethlehem in 1712. 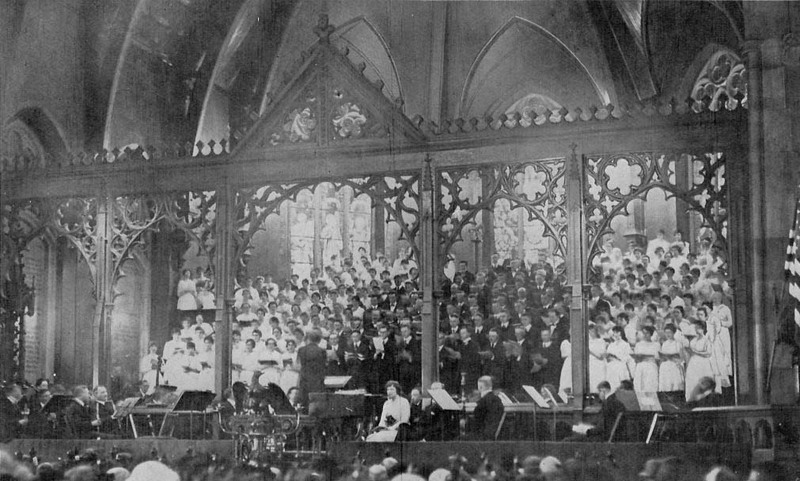 The Choir was founded in 1898 by its first conductor John Frederick Wolle, an organist at Central Moravian Church, and gave the first complete performances in America of the Mass in B Minor (1900) and Christmas Oratorio (1901). Since its founding in 1898, The Choir has been attracting thousands of visitors to the annual Bethlehem Bach Festival, now held on the campus of Lehigh University and in and around the historic Bethlehem neighborhood. Greg Funfgeld, the sixth conductor of The Choir, has been artistic director and conductor since 1983 and is now in his 36th season. He has expanded the programs of The Bach Choir beyond the annual Bach Festivals to become a year-round season of 31 concerts and educational programs with an audience of more than 20,000. The Archives of The Bach Choir of Bethlehem preserves documents related to the activities of The Choir, making them available for study. 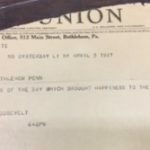 To schedule an appointment to view the Archives, contact Mary Dawson, Archivist.